Congratulations to Angela for being our May Patient of the Month! 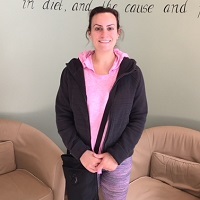 Angela started care at Precise Chiropractic in March 2017 after being referred to the office by her brother. Prior to starting care at Precise Chiropractic, Angela suffered with headaches that would lead to migraines for 15 years, and low back pain for over 5 years. “Whenever I had the headaches or migraines, life would be difficult because I had a hard time being able to function,” says Angela. Angela has benefitted greatly from being under NUCCA Chiropractic care. “Within the first few weeks after starting care at Precise Chiropractic, the lower back pain greatly improved and after about 2-3 months, the headaches and migraines got better. Now, the headaches, migraines and low back pain are GONE! It is amazing to get out of bed in the morning without a migraine. I am more active with my kids and can get on the floor and play with them,” says Angela. Whenever someone is sick, suffering or in pain, I recommend they come to Precise Chiropractic and get checked out. It will be the best decision they ever make. I love coming to Precise Chiropractic for my adjustments! I get excited to come to the office when I’m due for an adjustment, because I know that I am going to feel great that whole week!” says Angela.